Thoughts of owning a beachfront property are exciting. You’re imaging the vacation lifestyle full of water-play, golden rays of the sun, walking along the shoreline, waking up to the sounds and smells of water. Or, you may be considering purchasing a beach home as an investment property to rent out for income. Maybe both! 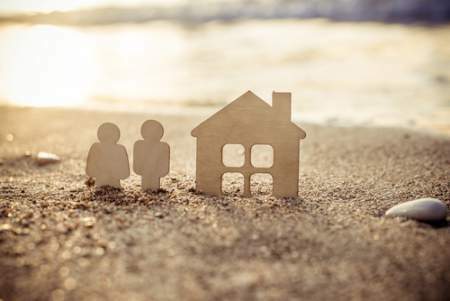 But before you jump into the waters of purchasing beachfront property, here are some things to consider when buying a beach home. There are many advantages to owning a beachfront home, whether you choose to live in it full time, use the house as a vacation home, or consider it an investment as a rental property. First, of course, is the lifestyle. Waking up with the beach in your backyard is a definite perk. Beach homes tend to maintain value or appreciate over time because of their location and demand. And, of course, you can rent that property out for a specified amount of time each year so that its upkeep is tax deductible. But it’s not all sunshine and seashells. There are cons, too. Your initial purchase cost can be significant. Your mortgage may be higher. Home maintenance is more expensive than inland houses. And, of course, you’ll be roomies with mother nature – subject to storm damage and flooding. Carefully weigh the positive aspects against the negatives of buying a beach house before you seal the deal. The best way to view a beach house is that it will serve as your vacation home for a period throughout the year, and then as a rental property for the rest of the time. Avoid buying a timeshare, and don’t over-extend your finances. You cannot depend on rental income to pay your mortgage, so only buy what you can afford. When using the property as an investment, make sure it’s vacation-worthy, meaning that it’s on the beach versus near the beach and that it’s furnished to suit large groups. Assess the location of the property concerning necessities and recreation. How close is the property to the grocery store? Is the house near restaurants, shops, or other conveniences? You may also benefit from researching the seasons in the area as some seasons may be unappealing and un-rentable. Keep in mind that in addition to the mortgage payment, you’ll also be paying for taxes, insurance, maintenance, and utilities. You can use the rent the house for tax deductions and help offset the costs of maintaining the property, but if you’re looking for a money-maker without making personal use of the property, there are better investments you can make. When you’re considering buying a property on the beach, you’ve got more to think about than finding the perfect house. In fact, the land on which the house sits should be of equal or greater importance. Investigate the water, know the water depths, the temperature of the water, changing shorelines, erosion, beach quality, wildlife, and migration. Are the waters suitable for swimming? Also, familiarize yourself with local laws and restrictions for boating and water recreation. Know who governs the land, and who governs the water. In some cases, government responsibilities are divided between city and county, each with differing laws. Before you buy, inspect the property for water damage. The first reason to examine the house is to discover repairs you may have to make upon purchase, which could prove to be more trouble than it’s worth. The second reason is to recognize that if water damage has already happened in the past, it’s likely to happen again in the future. Building regulations may prevent you from adding on to your beachfront property, including decks. Before you commit to the purchase of beachfront property, know what you can and cannot do with the land and structure. More and more, people are sharing the joys, responsibilities, and finances involved with owning a beachfront property. It’s easy to imagine vacationing with some of your best friends and comforting to know you don’t have to foot the entire bill alone. But sharing properties comes with risks – not only financially, but sharing a vacation home and a financial investment could end up destroying the friendship. Lay the ground rules first, and get it in writing. Define the rules, roles, and responsibilities shared by each party. Know ahead of time how you’ll handle scheduling, maintenance, and paying the bills. Also, define an exit strategy. Circumstances change and if your investment partner is suddenly unable to keep up their end of the bargain, how do you terminate the contract without conflict? Get pre-approved for your home mortgage loan first, and then consider your property taxes, insurance, flood insurance, utilities, and other expenses involved with owning a beach house. Knowing in advance what to expect for your monthly payments can help you determine your actual budget before buying. Remember, you do not have to accept the full amount of the loan that the lender approves, especially if borrowing that amount stretches the pocketbook beyond comfort. Don’t be afraid to start small. Just as many first-time buyers start their journey of ownership in a starter home, you can leave yourself room to grow. Don’t bite off more than you can chew when you can grow into the lifestyle comfortably. Should your beachfront property be a single-family detached house, or is a condo more efficient? That depends, in part, on how you intend to use the property, and how involved you plan to be with maintenance and repairs. A condo setting may offer more in the way of amenities such as a fitness center, swimming pool, and other perks, the condo lifestyle also puts you near neighbors, noise, and flurries of activity. A detached house may offer more seclusion and privacy, but lack some of the conveniences available in a condo. Determine your needs and then talk to your real estate agent and financial advisers to determine what steps to take in the pursuit of your beach home.